pockets and one inside pocket. 11" x 11" x 3"
sorry I don't know the maker of the pink spot fabric. Beautiful fabric flower brooch made by my very clever sister...... love the antique button! some rolled up tote bags for all of those purchases!!! I love the inside fabric - A Stitch in Time - Allover by Nutex N.Z. This bag went together very quickly. Easy pattern and instructions. I decided to make it out of some sewing theme fabric I had as I already own so many 'handbags' so this bag will become a project bag for craft. I love the fabric on the inside of the bag. It was quite funny when I was making the bag, I kept trying to pick off the threads until I realised that they were printed on the fabric! In other sewing news..... I finished off a Teddy quilt top that I have had stashed away waiting for the time I needed a gift quilt. just washed and out of the dryer! chunks of fabric! 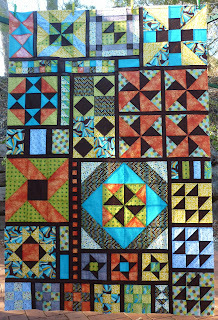 Stitch in the Ditch quilting although that often takes longer than doing a free-motion meander all over the quilt top. It gets a bit tricky when you have Appliqué blocks. Photo taken outside, quilt pegged to the clothes-line - bit breezy! I'm a little behind with my Batik version of this quilt. I'll work on it over the weekend I hope. I was able to use another June Tailor ruler recently. We had to make the ticker-tape block (that long skinny brown and orange squares block) and I found that the June Tailor Shape Cut Plus ruler worked perfectly to square up and trim the strips. You won't be surprised to hear that June Tailor rulers are on my shopping list for the Craft Show ! You have been very busy Helen. I always do my labels like that. Sew easy. Your bag is fabulous - such great fabrics! 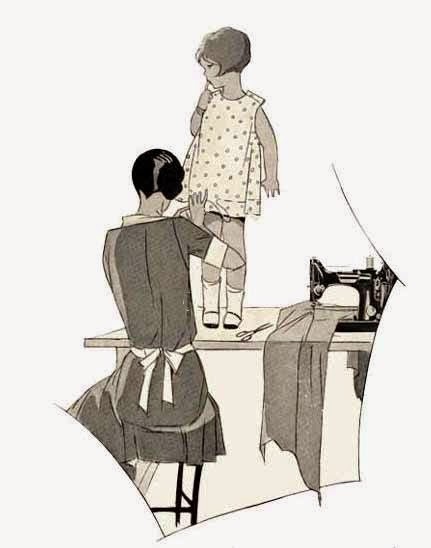 You are making the most of your time with all of your sewing. 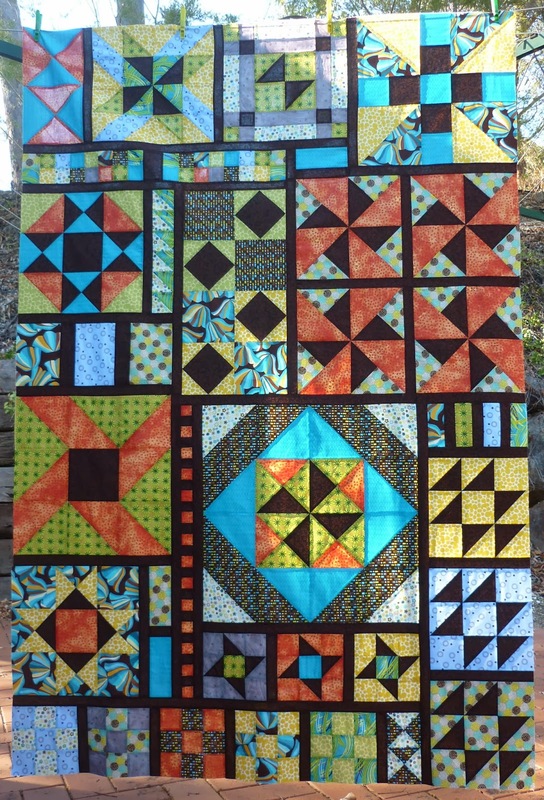 The accuracy quilt blocks look great. I love the triangle label Helen! I might need to try that on my next quilt. Your bag looks great. No point going to the show without the intention of buying stuff. I like the triangle label idea. I think I will try placing the square in the corner then sewing along the diagonal and folding it over to make the triangle. Love your bag brooch too! lots of lovely sewing.... there are a few of us meeting for a coffee on Wednesday at the show... which day are yoiu going? It was going so well until you mentioned the hot weather - grrr, jealous! Your new bag is adorable! Love the quilt too. You do such wonderful work. Thank you for sharing. Beautiful projects and I like your idea for the quilt label. Love your bag and your blog! Hope you had fun at the show! You've been busy! I love the project bag and teddy bear quilt is so cute!